By late December of 1991, I had been in law school at Columbia for two and one half years. New York City is not the easiest place to get out and go climbing, particularly because I did not own a car until a few months before, when my Mom gave me her old Honda CRX. I had managed to get out on a few trips to the Gunks, partnering with a guy I had met through an ad at one of the local Gunks shops. I had also been up to the Adirondacks a few times, climbing some of the classic waterfall ice pitches around chapel pond. 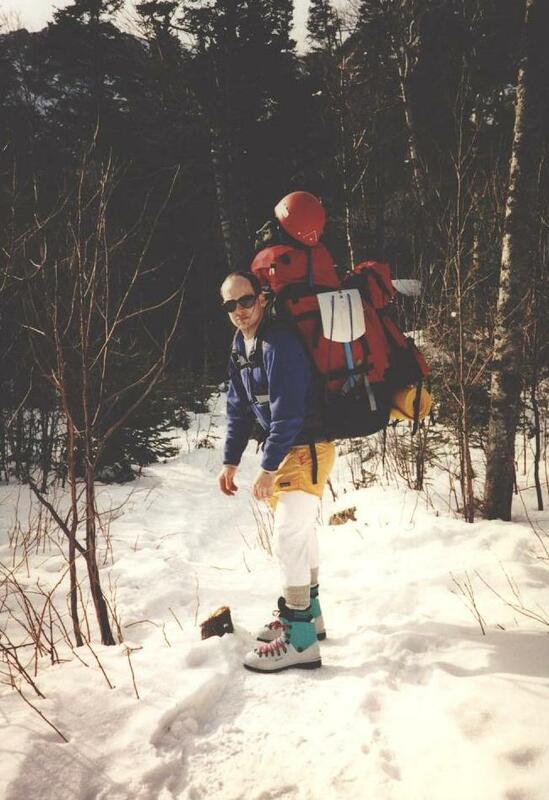 The winter before, a friend, Glenn, and I had done some ski touring up in New Hampshire at Mount Washington. It had been a pretty fun trip, and we had been exposed to some of the brutal weather for which Mount Washington was famous. We had begun skiing in the evening, and spent most of our time skiing up the trail in the dark. It was bitterly cold. It was so cold that plastic things began to lose their flexibility, and the baskets on my ski poles snapped and broke. My glasses got so cold that the lenses shrunk, and both of them fell out of the frames into the snow. It was snowing, and windy, and we missed the hut, due to the dark and the fact that we were a bit off the trail. We finally decided to set up camp, and we pitched our Chouinard Pyramid tent in the lee of a huge boulder. Glenn was pretty cold, due to the fact that he was wearing cotton long underwear, but we got him out of his cold, sweaty clothes and he recovered quickly. I was toasty in my huge Wilderness Experience expedition parka, and I had a very warm sleeping bag too. Unfortunately, Glenn had forgotten to bring his sleeping pad, so I ended up sharing one of my 2 thin pads with him. The temperature inside our tent after cooking dinner was still at least 30 below zero (as low as my thermometer would read), but we spent a relatively comfortable night. The following morning we broke camp and skied around checking out the area. We found the cabin deserted, with a sign on it saying that the guardian had left because of the extreme cold. We explored the cirque and saw the various gully routes, including Pinnacle Gully, the most famous of the Mount Washington climbs. In spite of the brutal weather, I decided that I needed to come back to Mount Washington and climb Pinnacle gully. About a year later, Matt, who was working on his Ph.D. at Ohio State University came out to see me, with the goal of climbing Mount Washington via the Pinnacle Gully. It was just after Christmas of 1991, and Matt and I took off at high speed in my CRX headed for New Hampshire. Because of my experience with the cold the previous year, we were loaded down with the warmest clothes available: plastic double boots with insulated super gaiters, pile pants, down jackets, heavy balaclavas, thick mittens, full gore-tex shells, expedition sleeping bags, etc. Our plan was to spend our first day climbing the water ice routes at Crawford notch, and then move on to some gully climbs on Mount Washington itself. The first day of ice climbing at Crawford Notch was pretty uneventful. The weather was unseasonably warm, and the water ice routes were thin and wet. We climbed several of the classic ice flows, until one of my plastic boots (Koflach Viva Softs) split open at the toe. We then drove back to North Conway and rented a pair of plastic boots for me and spent the rest of the evening at a bed and breakfast. The bed and breakfast was a nice place. Cheery and cozy, with a big fire in the fireplace and a big friendly dog. Unfortunately, I was feeling really sick with a bad cold. Through the wonders of nyquil liqui-caps, and hot cider I was able to get a good night's sleep, and felt much better by morning. We arrived in the parking lot at the Mount Washington visitor's center to find that the weather had become even warmer, in the high 40's. Still, I remembered the cold of the year before, and that, coupled with the mountain's reputation for nasty weather convinced us to bring all of our cold weather gear. As a result of our determination to be ready for anything, we began the hike up to the cabin wearing shorts, but carrying huge packs filled with enough clothing and equipment to keep us comfortable at 30 below zero. We took a "short cut" to the cabin, which was shorter in distance but which took much longer than the normal path due to the fact that we ended up post-holing through deep snow much of the way. We finally reached the cabin, and met the guardian, a nice, friendly guy. To save money, we had decided to sleep in a tent rather than in the cabin, and we pitched our tent near the cabin. We spent the remainder of that day just messing around. Although we were sleeping in the tent, we hung out in the cabin, and met several nice people, including a guy and his girl friend (both from Washington, D.C.) and two other middle-aged guys who had been climbing that day and were headed out the next. We played trivial pursuit and some other climbing board game, and finally headed off to bed in our tent. We were headed for Odell's gully the next day. The night was comfortable, particularly so because it barely got below freezing, and we both were sleeping in expedition bags rated to 30 below zero. We woke up early, brewed up some oatmeal and hot chocolate, and then headed off to climb Odell's gully, making the approach by headlamp. The climbing on Odell's gully was pretty straightforward. We kicked steps in mushy snow all the way up the relatively low angle route. There was no need for placing protection, and we pretty much simul-climbed the whole way. It was a fun climb, in spite of the relative lack of difficulty, and we practiced doing boot axe belays and other snow climbing techniques. When we pulled over the top of the Gully, we were faced with the hike across the "alpine garden" over to the descent trail. Crossing this flat expanse turned out to be the crux of the climb. The snow had drifted with the wind, and was not hard enough to support our weight, and we were soon wallowing up to our hips. In many places, we were unable to make any forward progress at all by walking so we took to rolling across the deeper sections (not easy when wearing a pack.) It took us forever to finally make it across to the descent trail, and by the time we made it back to the cabin, we were both completely worn out from fighting our way through the deep snow. That night, we decided to stay in the cabin. We were tired from our exertions, and wanted a comfortable place to unwind and relax. Besides, it was New Year's Eve, and we felt like we should celebrate a little. That evening was a lot of fun. There was a group of French-Canadian climbers there and we had a great time talking and laughing with them and the hut guardian. We cooked lots of food and ate and drank a large feast. Finally, we settled down to sleep, eager for the morning when we would climb Pinnacle Gully. The next day, we were up before dawn, and quietly dressed, ate, and gathered the gear for our climb. 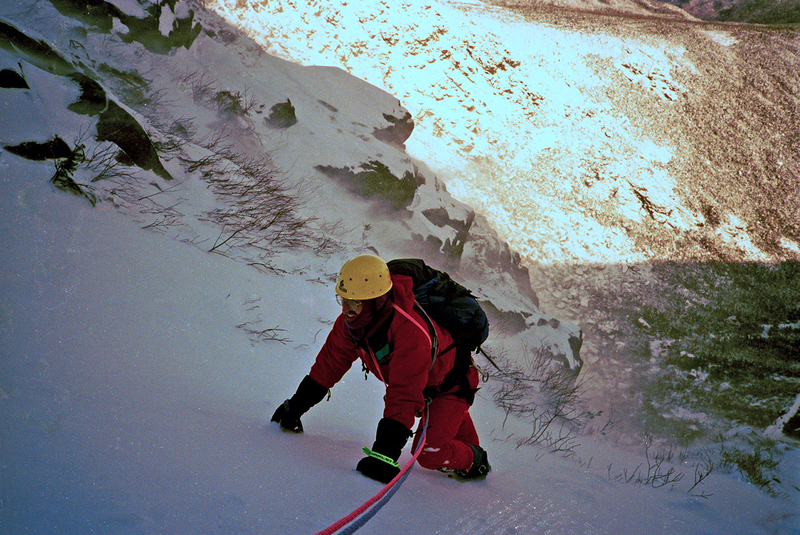 We arrived at the base of Pinnacle Gully about an hour after sunrise and began climbing. The climbing on Pinnacle was steeper and more technical than on Odell's, but still wasn't difficult. There was mostly water ice on the first couple of pitches, and there were nice wide steps in between the steeper sections. It was pretty warm, however, and the ice was already pretty wet, with water percolating beneath it. I led the crux on the second pitch with a couple of screws for protection, and then it was easier going on up to the top. The climbing was mostly kicking steps in snow, with occasional sections of water ice. It was a very enjoyable climb, but we worried a bit about avalanche danger from wet snow slides, so we hurried to get out of the gully, in spite of the beautiful position. When we reached the top of the gully and exited out onto the alpine garden, we were elated. This had been a great day. The climbing had been aesthetic and fun, with just enough challenge to give us the occasional adrenaline rush. The route had a great "alpine" feel to it. It had been a great adventure. Best of all, the route from the top of Pinnacle Gully to the descent trail was heavily traveled and the snow was nicely packed down. There would be no rolling or groveling through giant snow drifts today. By the time we reached the cabin, we were dead tired, and again decided to spend the night in the cabin, rather than our little tent. We cooked up the remainder of our food, and spent a quiet evening reading old climbing magazines and relaxing. The next morning, we gathered up our belongings and headed back out. We showered at the pay showers at the Mount Washington visitor's center, and then headed home. It had been a wonderful trip, another in a succession of Matt's and my adventures together.